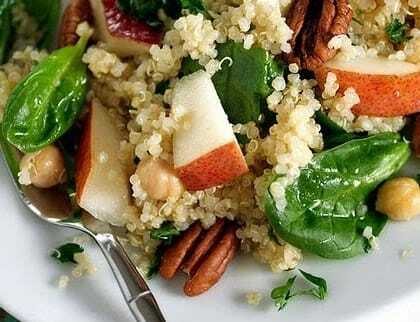 Treat yourself to this delicious and easy Autumn inspired Pear, Quinoa, and Spinach salad for just 4 Points per serving. Fresh and light, this quinoa salad makes a wonderful low calorie side dish recipe to serve with a variety of Fall meals, or as a non-traditional Thanksgiving dish. By removing the nuts and the chickpeas, as well as making a few other changes to the traditional version of this recipe, I was able to create a much lighter rendering without sacrificing the fabulous flavors. The slight nutty flavor of the quinoa grains is enhanced with a walnut oil and pomegranate vinegar dressing, and is a tasty contrast to the sweet, delicate pears. Definitely a great salad recipe to try out if you are want to enjoy some fabulous Fall flavors in a new way. The perfect vegetarian side dish recipe, this Pear, Quinoa and Spinach Salad is a fresh and delicious way to enjoy the flavors of the season. And each serving is just 4 Points making it a great low calorie side to accompany any meal. Bring 2 cups of broth to a boil in a large saucepan. Add in quinoa, reduce heat to maintain a simmer, cover and cook until the liquid is absorbed and the quinoa has popped, about 15 minutes. Whisk oil, vinegar, 1 tbsp broth, chives, salt and pepper in a large bowl. Add pears, spinach and onion and toss to coat. Drain any excess liquid from the cooked quinoa, if necessary. Add the quinoa to the pear mixture; toss to combine. Transfer to the refrigerator to cool for about 15 minutes or serve warm. Thank you for this recipe. I made it for Thanksgiving dinner and everyone loved it! I added half of a pomegranite and the taste and color were marvelous. You are so generous to revamp recipes and make them healthy for all of your readers. Changing a lifestyle is very difficult but you have made it so much easier for me to stick to the plan and eat healthier. Where are the pecans and garbanzo beans shown in the picture?